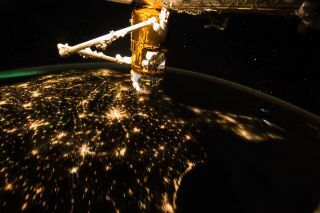 The United States glows in the early morning darkness in an image taken by Scott Kelly aboard the International Space Station. On the halfway point of his year-long mission in space, NASA astronaut Scott Kelly captured this stunning image of the United States early in the morning. "Clear skies over much of the USA today. #GoodMorning from @Space_Station! #YearInSpace," the astronaut wrote on Twitter Sept. 15. Kelly and Kornienko are doing a suite of experiments to look at their bone loss, muscle tone, eye pressure and other indicators that commonly change for astronauts who are in space between four and six months. In addition, Kelly is doing a set of genetic experiments to compare with his twin brother Mark Kelly. Mark is a retired space shuttle astronaut who commanded one of the last missions in 2011. NASA says the year-long mission will help it better position itself for a future mission to Mars. While the longest single stay in space was 437 days (by Valeri Polyakov in 1994 to 1995, on the Russian Mir space station), a Mars mission would take at least 500 days. Prior to this mission, a few year-long (or longer) missions took place on Mir in the 1990s. Today's better genetic technology and deeper understanding of how the human body is influenced by microgravity helped NASA and the Russian Federal Space Agency to go forward with the longer mission for Kelly and Kornienko.